Noodles are a food that’s been around for hundreds, if not thousands of years. There are variations all across the world, from fresh Italian pasta made with semolina to Chinese hand pulled la mein to the thick udon noodles of Japan and the wide flat rice noodles used in Thai pad see yew. But in all these years noodles have existed, the biggest innovation applied to noodles has been Momofuku Ando’s creation of the beloved instant noodles. But, as we all know, instant noodles sacrifice health for their convenience. The high sodium, frying, and lack of vitamins, protein and fiber, have made instant noodles a tasty food that... Look, all we’re saying is that if you had to go wrestle a bear the next day, instant ramen probably wouldn’t be your first pick for a meal that’ll put you at your peak performance. We didn’t want to make the choice between delicious, nutritious, fast, and a wrestling match with a bear-y good friend, and we don’t think anyone else should either. Noodles you can fight a bear with (not really please don't). How much more Overwatch do we have time for? So what really goes into it? How did we go from unhealthy fried wheat and water into the healthiest instant ramen ever made? 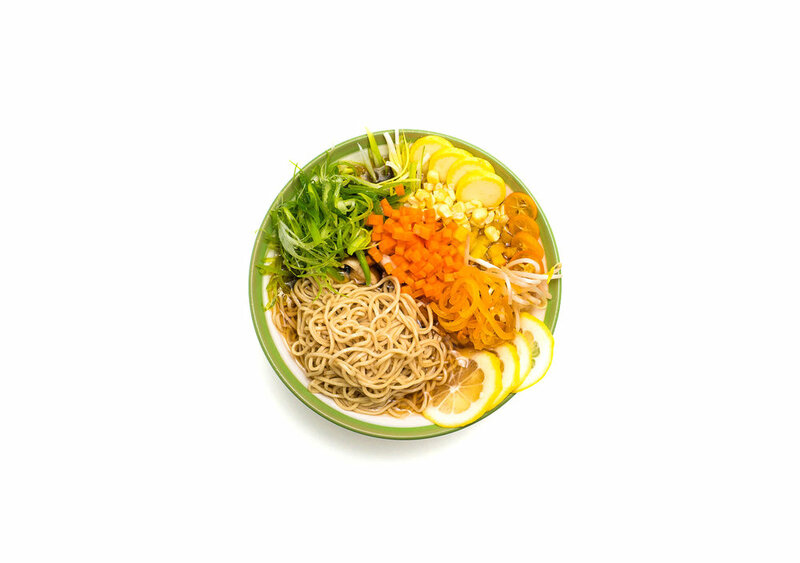 This is the anatomy of Vite Ramen. We knew that your standard wheat flour wouldn’t make the cut by itself, and we would need to blend different flours into the mix to achieve our goals. We wanted a blend that not only had high overall protein content, but also encompassed a full range of amino acids. It also needed to have a smooth mouthfeel and chew, rehydrate properly, and of course taste delicious! Protein content was an important consideration in making the healthy noodles we envisioned. Just because the amount of protein is high on the nutrition label doesn’t mean it’ll cover all your bases! Proteins are made up of building blocks called amino acids, and your body needs every single building block there. It’s known as having a complete protein. If you’re missing one of those amino acids, then the whole thing just isn’t as effective anymore, like NSYNC without Justin Timberlake. In animal based proteins like eggs, milk or meat, all of the amino acids are present in large quantities. Plant based proteins are usually lacking in one or two. In wheat flour’s case, its missing Justin Timberlake is an amino acid called lysine (sometimes also called L-lysine). He's bringing complete proteins back. We considered mixing in high lysine flours like amaranth and sorghum with wheat flour, but the texture became grainy and unappealing. It tasted “healthy.” And when people say things taste “healthy”, it’s not usually a compliment. So we reformulated. After more tries, more grinds and more techniques to smooth out the grittiness, we shifted to complete protein flours instead-- soy and quinoa. These flours contained all the amino acids required for a complete protein, which fixed the complete protein gaps in regular wheat flour. So it was time to give them a shot and see how this mix fared as noodles! One of the first things we determined was that wheat flour would be exceptionally important to creating a good noodle, since gluten is the only protein that can create the kind of stretchy lattice structure with the desired chew and elasticity. When you normally work with a wheat dough, gluten forms structures that are like little strands of thread. The more you work them together, the more tangled they get, and the stronger they get. Folding them mostly in one direction will let them come together in a smooth, strong structure, kind of like how you would weave together a rope or a braid. Soybean flour seemed, on paper, like a perfect choice to blend into our flour mixture. It had a healthy lipid content that we could introduce directly into the noodles themselves, as well as the complete protein content that we were looking for. But as we began to actually work with the flour, we discovered a problem-- That same lipid content which made soybean flour a good candidate for macronutrient balance was also preventing the formation of our gluten structure. The problem with introducing lipids was that these globules block the tangling process from happening, resulting in a pile of crumbly dough. It’s like trying to build Ikea furniture covered in grease (ew). Think of pies, croissants, shortbread, tarts, and pastries; they’re all delicious, and they all have a lot of butter and shortening to make them crispy, flaky, or crumbly. Great for baking, but not so much for noodles. After a lot of frustration, we cut soy from our potential list of candidates. Quinoa turned out to the golden ticket. It’s an excellent substitute for flour because it forms its own kind of protein lattice, which makes a solid supporting structure alongside gluten. Not only that, but it was also a complete protein (including lysine), which meant it would fill in the amino acid deficiencies we had. The ground quinoa also contained a healthy amount of fiber, and was ground fine enough that there was none of the grittiness or weird textures of other flours. Three other ingredients are present in our noodles: additional lysine, vital wheat gluten and guar gum. We’ve already introduced Justi--err, lysine to you as an important amino acid in a complete protein. So why add more, if quinoa already has it? First off, quinoa fell just a little short of the lysine goals we set, so we wanted to make sure all of it was there. As it turns out, lysine is also a relatively fragile amino acid, and can suffer some degradation in high temperatures. While the degradation temperature is a little higher than boiling, we felt that preemptively compensating for the heat was probably a good idea. Vital wheat gluten is another topic that is hopefully already familiar! It’s another name for gluten that has been taken from wheat flour. Providing additional vital wheat gluten gave us more of the noodle elasticity and chew that we were after, as well as giving the overall protein content another welcome boost! With such a high protein content, we started having issues with the noodles not being quite as instant as we wanted. Protein isn’t great at absorbing water, so it was taking almost 10 whole minutes to cook! The solution? Guar gum. (EDIT: We're now using corn fiber!) Guar gum is a polysaccharide that occurs in guar beans and is often used as a thickener in food. However, like the puppy next door, it also has the awesome property of being extremely hydrophillic (water loving). Adding it to our noodles allowed them to absorb water far more efficiently, and dropped the cooking time down to the 3-4 minutes we all know and love. As a bonus, guar gum is also high in heart healthy soluble fiber! Thanks a ton for making it all the way through! We hope you enjoyed it and learned something about our noodles and the thought process behind choosing our ingredients. If you have any questions, feel free to email us or contact us on any of our social media accounts!